THE period designated as 'between the two evenings,'1 when the Paschal Lamb was to be slain, was past. There can be no question that, in the time of Christ, it was understood to refer to the interval between the commencement of the sun's decline and what was reckoned as the hour of his final disappearance (about 6 P.M.). The first three stars had become visible, and the threefold blast of the Silver Trumpets from the Temple-Mount rang it out to Jerusalem and far away, that the Pascha had once more commenced. In the festively-lit 'Upper Chamber' of St. Mark's house the Master and the Twelve were now gathered. Was this place of Christ's last, also that of the Church's first, entertainment; that, where the Holy Supper was instituted with the Apostles, also that, where it was afterwards first partaken of by the Church; the Chamber where He last tarried with them before His Death, that in which He first appeared to them after His Resurrection; that, also, in which the Holy Ghost was poured out, even as (if the Last Supper was in the house of Mark) it undoubtedly was that in which the Church was at first wont to gather for common prayer?2 We know not, and can only venture to suggest, deeply soul-stirring as such thoughts and associations are. 1. Ex. 12:6; Lev. 23:5; Numb. 9:3, 5. 2. Acts 12:12, 25. 3. St. John 2:13. 4. St. Matt. 15:21, &c.
And, in truth, as we think of it, we can understand not only why the Lord could not have offered any other Sacrifice, but that it was most fitting He should have offered this one Pascha, partaken of its commemorative Supper, and connected His own New Institution with that to which this Supper pointed. This joining of the Old with the New, the one symbolic Sacrifice which He offered with the One Real Sacrifice, the feast on the sacrifice with that other Feast upon the One Sacrifice, seems to cast light on the words with which He followed the expression of His longing to eat that one Pascha with them: 'I say unto you, I will not eat any more5 thereof,6 until it be fulfilled in the Kingdom of God.' And has it not been so, that this His last Pascha is connected with that other Feast in which He is ever present with His Church, not only as its Food but as its Host, as both the Pascha and He Who dispenses it? With a Sacrament did Jesus begin His Ministry: it was that of separation and consecration in Baptism. With a second Sacrament did He close His Ministry: it was that of gathering together and fellowship in the Lord's Supper. Both were into His Death: yet not as something that had power over Him, but as a Death that has been followed by the Resurrection. For, if in Baptism we are buried with Him, we also rise with Him; and if in the Holy Supper we remember His Death, it is as that of Him Who is risen again - and if we show forth that Death, it is until He come again. And so this Supper, also, points forward to the Great Supper at the final consummation of His Kingdom. 5. We prefer retaining this in the text. 6. Such would still be the meaning, even if the accusative 'it' were regarded as the better reading. It is difficult to decide how much, not only of the present ceremonial, but even of the Rubric for the Paschal Supper, as contained in the oldest Jeweish Documents, may have been obligatory at the time of Christ. Ceremonialism rapidly develops, too often in proportion to the absence of spiritual life. Probably in the earlier days, even as the ceremonies were simpler, so more latitude may have been left in their observance, provided that the main points in the ritual were kept in view. We may take it, that, as prescribed, all would appear at the Paschal Supper in festive array. We also know, that, as the Jewish Law directed, they reclined on pillows around a low table, each resting on his left hand, so as to leave the right free. But ancient Jewish usage casts a strange light on the painful scene with which the Supper opened. Sadly humiliating as it reads, and almost incredible as it seems, the Supper began with 'a contention among them, which of them should be accounted to be greatest.' We can have no doubt that its occasion was the order in which they should occupy places at the table. We know that this was subject of contention among the Pharisees, and that they claimed to be seated according to their rank.7 A similar feeling now appeared, alas! in the circle of the disciples and at the Last Supper of the Lord. Even if we had not further indications of it, we should instinctively associate such a strife with the presence of Judas. St. John seems to refer to it, at least indirectly, when he opens his narrative with this notice: 'And during supper, the devil having already cast it into his heart, that Judas Iscariot, the son of Simon, shall betray Him. '8 For, although the words form a general introduction to what follows, and refer to the entrance of Satan into the heart of Judas on the previous afternoon, when he sold his Master to the Sanhedrists, they are not without special significance as place in connection with the Supper. But we are not left to general conjecture in regard to the influence of Judas in this strife. There is, we believe, ample evidence that he not only claimed, but actually obtained, the chief seat at the table next to the Lord. This, as previously explained, was not, as is generally believed, at the right, but at the left of Christ, not below, but above Him, on the couches or pillows on which they reclined. 7. W�nsche (on St. John xiii. 2) refers to Pes. 108 a, and states in a somewhat general way that no order of rank was preserved at the Paschal Table. But the passage he quotes does not imply this - only, that without distinction of rank all sat down at the same table, but not that the well-established order of sitting was infringed. The Jerusalem Talmud says nothing on the subject. The Gospel-narrative, of course, expressly states that there was a contention about rank among the disciples. In general, there are a number of inaccuracies in the part of W�nsche's Notes referring to the Last Supper. From the Gospel-narratives we infer, that St. John must have reclined next to Jesus, on His Right Hand, since otherwise he could not have leaned back on His Bosom. This, as we shall presently show, would be at one end - the head of the table, or, to be more precise, at one end of the couches. For, dismissing all conventional ideas, we must think of it as a low Eastern table. In the Talmud,9 the table of the disciples of the sages is described as two parts covered with a cloth, the other third being left bare for the dishes to stand on. There is evidence that this part of the table was outside the circle of those who were ranged around it. Occasionally a ring was fixed in it, by which the table was suspended above the ground, so as to preserve it from any possible Levitical defilement. During the Paschal Supper, it was the custom to remove the table at one part of the service; or, if this be deemed a later arrangement, the dishes at least would be taken off and put on again. This would render it necessary that the end of the table should protrude beyond the line of guests who reclined around it. For, as already repeatedly stated, it was the custom to recline at table, lying on the left side and leaning on the left hand, the feet stretching back towards the ground, and each guest occupying a separate divan or pillow. It would, therefore, have been impossible to place or remove anything from the table from behind the guests. Hence, as a matter of necessity, the free end of the table, which was not covered with a cloth, would protrude beyond the line of those who reclined around it. We can now form a picture of the arrangement. Around a low Eastern table, oval or rather elongated, two parts covered with a cloth, and standing or else suspended, the single divans or pillows are ranged in the form of an elongated horseshoe, leaving free one end of the table, somewhat as in the accompanying woodcut. 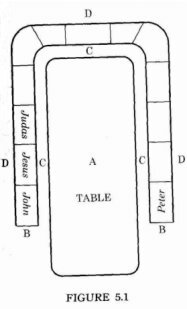 Here A represents the table, B B respectively the ends of the two rows of single divans on which each guest reclines on his left side, with his head (C) nearest the table, and his feet (D) stretching back towards the ground. 9. B Bathr 57 b. So far for the arrangement of the table. Jewish documents are equally explicit as to that of the guests. It seems to have been quite an established rule10 that, in a company of more than two, say of three, the chief personage or Head - in this instance, of course, Christ - reclined on the middle divan. We know from the Gospel-narrative that John occupied the place on His right, at that end of the divans - as we may call it - at the head of the table. But the chief place next to the Master would be that to His left, or above Him. In the strife of the disciples, which should be accounted the greatest, this had been claimed, and we believe it to have been actually occupied, by Judas. This explains how, Christ whispered to John by what sign to recognise the traitor,11 none of the other disciples heard it. It also explains, how Christ would first hand to Judas the sop, which formed part of the Paschal ritual, beginning with him as the chief guest at the table, without thereby exciting special notice. Lastly, it accounts for the circumstance that, when Judas, desirous of ascertaining whether his treachery was known, dared to ask whether it was he, and received the affirmative answer,12 no one at table knew what had passed. But this could not have been the case, unless Judas had occupied the place next to Christ; in this case, necessarily that at His left, or the post of chief honour. As regards Peter, we can quite understand how, when the Lord with such loving words rebuked their self-seeking and taught them of the greatness of Christian humility, he should, in his petuosity of shame, have rushed to take the lowest place at the other end of the table.13 Finally, we can now understand how Peter could beckon to John, who sat at the opposite end of the table, over against him, and ask him across the table, who the traitor was.14 The rest of the disciples would occupy such places as were most convenient, or suited their fellowship with one another. 10. Ber. 46 b; Tos. Ber. v.; Jer. Taan, 68 a, towards the bottom. 11. St. John 13:26. 12. St. Matt. 26:25. 15. St. Luke 22:25, 28. 16. Not 'temptation' - i.e. not assaults from within, but assults from without. 17. The 'sitting down with Him' at the feast is evidently a promise of joy, reward, and fellowship. The sitting on thrones and judging Israel must be taken as in contrast to the 'temptation' of the contradiction of Christ and of their Apostolic message - as their vindication against Israel's present gainsaying. So speaking, the Lord commenced that Supper, which in itself was symbol and pledge of what He had just said and promised. The Paschal Supper began, as always,18 by the Head of the Company taking the first cup, and speaking over it 'the thanksgiving.' The form presently in use consists really of two benedictions - the first over the wine, the second for the return of this Feastday with all that it implies, and for being preserved once more to witness it.19 Turning to the Gospels, the words which follow the record of the benediction on the part of Christ20 seem to imply, that Jesus had, at any rate, so far made use of the ordinary thanksgiving as to speak both these benedictions. We know, indeed, that they were in use before His time, since it was in dispute between the Schools of Hillel and Shammai, whether that over the wine or that over the day should take precedence. That over the wine was quite simple: 'Blessed art Thou, Jehovah our God, Who hast created the fruit of the Vine!' The formula was so often used in blessing the cup, and is so simple, that we need not doubt that these were the very words spoken by our Lord. It is otherwise as regards the benediction 'over the day,' which is not only more composite, but contains words expressive of Israel's national pride and self-righteousness, such as we cannot think would have been uttered by our Lord. With this exception, however, they were no doubt identical in contents with the present formula. This we infer from what the Lord added, as He passed the cup round the circle of the disciples.21 No more, so He told them, would He speak the benediction over the fruit of the vine - not again utter the thanks 'over the day' that they had been 'preserved alive, sustained, and brought to this season.' Another Wine, and at another Feast, now awaited Him - that in the future, when the Kingdom would come. It was to be the last of the old Paschas; the first, or rather the symbol and promise, of the new. And so, for the first and last time, did He speak the twofold benediction at the beginning of the Supper. 19. The whole formula is given in 'The Temple and its Services,' pp. 204, 205. 21. I have often expressed my conviction that in the ancient Services there was considerable elasticity and liberty left to the individual. At present a cup is filled for each individual, but Christ seems to have passed the one cup round among the Disciples. Whether such was sometimes done, or the alteration was designedly, and as we readily see, significantly, made by Christ, cannot now be determined. The cup, in which, according to express Rabbinic testimony,22 the wine had been mixed with water before it was 'blessed,' had passed round. The next part of the ceremonial was for the Head of the Company to rise and 'wash hands.' It is this part of the ritual of which St. John23 records the adaptation and transformation on the part of Christ. The washing of the disciples' feet is evidently connected with the ritual of 'handwashing.' Now this was done twice during the Paschal Supper:24 the first time by the Head of the Company alone, immediately after the first cup; the second time by all present, at a much later part of the service, immediately before the actual meal (on the Lamb, &c.). If the footwashing had taken place on the latter occasion, it is natural to suppose that, when the Lord rose, all the disciples would have followed His example, and so the washing of their feet would have been impossible. Again, the footwashing, which was intended both as a lesson and as an example of humility and service,25 was evidently connected with the dispute 'which of them should be accounted to be greatest.' If so, the symbolical act of our Lord must have followed close on the strife of the disciples, and on our Lord's teaching what in the Church constituted rule and greatness. Hence the act must have been connected with the first handwashing - that by the Head of the Company - immediately after the first cup, and not with that at a later period, when much else had intervened. 22. Babha B. 97 b, lines 11 and 12 from top. 23. St. John 13. 24. Pes. x. 4. 25. St. John 13:12-16. All else fits in with this. For clearness' sake, the account given by St. John26 may here be recapitulated. The opening words concerning the love of Christ to His own unto the end form the general introduction.27 Then follows the account of what happened 'during Supper'28 - the Supper itself being left undescribed - beginning, by way of explanation of what is to be told about Judas, with this: 'The Devil having already cast into his (Judas') heart, that Judas Iscariot, the son of Simon, shall betray Him.' General as this notice is, it contains much that requires special attention. Thankfully we feel, that the heart of man was not capable of originating the Betrayal of Christ; humanity had fallen, but not so low. It was the Devil who had 'cast' it into Judas' heart - with force and overwhelming power.29 Next, we mark the full description of the name and parentage of the traitor. It reads like the wording of a formal indictment. And, although it seems only an introductory explanation, it also points to the contrast with the love of Christ which persevered to the end,30 even when hell itself opened its mouth to swallow Him up; the contrast, also, between what Jesus and what Judas were about to do, and between the wild storm of evil that raged in the heart of the traitor and the calm majesty of love and peace which reigned in that of the Saviour. 27. Godet, who regards ver. 1 as a general, and ver. 2 as a special, introduction to the foot-washing, calls attention to the circumstance that such introductions not unfrequently occur in the Fourth Gospel. 29. The contrast is the more marked as the same verb (ballein) is used both of Satan 'casting' it into the heart of Judas, and of Christ throwing into the basin the water for the footwashing. If what Satan had cast into the heart of Judas explains his conduct so does the knowledge which Jesus possessed account for that He was about to do.31 32 Many as are the thoughts suggested by the words, 'Knowing that the Father had given all things into His Hands, and that He came forth from God, and goeth unto God' - yet, from evident connection, they must in the first instance be applied to the Footwashing, of which they are, so to speak, the logical antecedent. It was His greatest act of humiliation and service, and yet He never lost in it for one moment aught of the majesty or consciousness of His Divine dignity; for He did it with the full knowledge and assertion that all things were in His Hands, and that He came forth from and was going unto God - and He could do it, because He knew this. Here, not side by side, but in combination, are the Humiliation and Exaltation of the God-Man. And so, 'during Supper,' which had begun with the first cup, 'He riseth from Supper.' The disciples would scarcely marvel, except that He should conform to that practice of handwashing, which, as He had often explained, was, as a ceremonial observance, unavailing for those who were not inwardly clean, and needless and unmeaning in them whose heart and life had been purified. But they must have wondered as they saw Him put off His upper garment, gird Himself with a towel, and pour water into a basin, like a slave who was about to perform the meanest service. 31. St. John 11. 32. Bengel: magna vis. From the position which, as we have shown, Peter occupied at the end of the table, it was natural that the Lord should begin with him the act of footwashing.33 Besides, had He first turned to others, Peter must either have remonstrated before, or else his later expostulation would have been tardy, and an act either of self-righteousness or of needless voluntary humility. As it was, the surprise with which he and the others had witnessed the preparation of the Lord burst into characteristic language when Jesus approached him to wash his feet. 'Lord - Thou - of me washest the feet!' It was the utterance of deepest reverence for the Master, and yet of utter misunderstanding of the meaning of His action, perhaps even of His Work. Jesus was now doing what before He had spoken. The act of externalism and self-righteousness represented by the washing of hands, and by which the Head of the Company was to be distinguished from all others and consecrated, He changed into a footwashing, in which the Lord and Master was to be distinguished, indeed, from the others - but by the humblest service of love, and in which He showed by His example what characterised greatness in the Kingdom, and that service was evidence of rule. And, as mostly in every symbol, there was the real also in this act of the Lord. For, by sympathetically sharing in this act of love and service on the part of the Lord, they who had been bathed - who had previously become clean in heart and spirit - now received also that cleansing of the 'feet,' of active and daily walk, which cometh from true heart-humility, in opposition to pride, and consisteth in the service which love is willing to render even to the uttermost. 33. St. Chrysostom and others unduly urge the words (ver. 6), 'He cometh to Peter.' He came to him, not after the others, but from the place where the basin and water for the purification had stood. But Peter had understood none of these things. He only felt the incongruousness of their relative positions. And so the Lord, partly also wishing thereby to lead his impetuosity to the absolute submission of faith, and partly to indicate the deeper truth he was to learn in the future, only told him, that though he knew it not now, he would understand hereafter what the Lord was doing. Yes, hereafter - when, after that night of terrible fall, he would learn by the Lake of Galilee what it really meant to feed the lambs and to tend the sheep of Christ; yes, hereafter - when no longer, as when he had been young, he would gird himself and walk whither he would. But, even so, Peter could not content himself with the prediction that in the future he would understand and enter into what Christ was doing in washing their feet. Never, he declared, could he allow it. The same feelings, which had prompted him to attempt withdrawing the Lord from the path of humiliation and suffering,34 now asserted themselves again. It was personal affection, indeed, but it was also unwillingness to submit to the humiliation of the Cross. And so the Lord told him, that if He washed him not, he had no part with Him. Not that the bare act of washing gave him part in Christ, but that the refusal to submit to it would have deprived him of it; and that, to share in this washing, was, as it were, the way to have part in Christ's service of love, to enter into it, and to share it. They were clean, these disciples, but not all. For He knew that there was among them he 'that was betraying Him. '35 He knew it, but not with the knowledge of an inevitable fate impending far less of an absolute decree, but with that knowledge which would again and again speak out the warning, if by any means he might be saved. What would have come, if Judas had repented, is as idle a question as this: What would have come if Israel, as a nation, had repented and accepted Christ? For, from our human standpoint, we can only view the human aspect of things - that earthwards; and here every action is not isolated, but ever the outcome of a previous development and history, so that a man always freely acts, yet always in consequence of an inward necessity. 35. So the expression in St. John 13:11, more accurately rendered. 37. upodeigma. The distinctive meaning of the word is best gathered from the other passages in the N.T. in which it occurs, viz. Heb. 4:11; 8:5; 9:23; St. James 5:10; 2 Pet. 2:6. For the literal outward imitation of this deed of Christ in the ceremony of footwashing, still common in the Roman Catholic Church, see Bingham, Antiq. xii. 4, 10. 38. ofeilete. 39. The word is that employed in the 'Beatitudes,' makarioi. 40. Shem. R. 20. 41. Ezek. 16:9. 42. Comp. Ezek. 16:10; Ex. 19:4; 13:21. 43. ynwd)w yb) ybr or yrwmw ybr. 44. Comp. St. John 13:17. 45. Kidd, 42 a. 46. Ber. R. 78. 47. Yalkut on Is. ix. vol. ii. p. 56 d, lines 12, 13 from top. But to return. The footwashing on the part of Christ, in which Judas had shared, together with the explanatory words that followed, almost required, in truthfulness, this limitation: 'I speak not of you all.' For it would be a night of terrible moral sifting to them all. A solemn warning was needed by all the disciples. But, besides, the treachery of one of their own number might have led them to doubt whether Christ had really Divine knowledge. On the other hand, this clear prediction of it would not only confirm their faith in Him, but show that there was some deeper meaning in the presence of a Judas among them.48 We come here upon these words of deepest mysteriousness: 'I know those I chose; but that the Scripture may be fulfilled, He that eateth My Bread lifteth up his heel against Me! '49 It were almost impossible to believe, even if not forbidden by the context, that this knowledge of which Christ spoke, referred to an eternal foreknowledge; still more, that it meant Judas had been chosen with such foreknowledge in order that this terrible Scripture might be fulfilled in him. Such foreknowledge and foreordination would be to sin, and it would involve thoughts such as only the harshness of our human logic in its fatal system-making could induce anyone to entertain. Rather must we understand it as meaning that Jesus had, from the first, known the inmost thoughts of those He had chosen to be His Apostles; but that by this treachery of one of their number, the terrible prediction of the worst enmity, that of ingratitude, true in all ages of the Church, would receive its complete fulfilment.50 The word 'that' - 'that the Scripture may be fulfilled,' does not mean 'in order that,' or 'for the purpose of;' it never means this in that connection;51 and it would be altogether irrational to suppose that an event happened in order that a special prediction might be fulfilled. Rather does it indicate the higher internal connection in the succession of events, when an event had taken place in the free determination of its agents, by which, all unknown to them and unthought of by others, that unexpectedly came to pass which had been Divinely foretold. And herein appears the Divine character of prophecy, which is always at the same time announcement and forewarning, that is, has besides its predictive a moral element: that, while man is left to act freely, each development tends to the goal Divinely foreseen and foreordained. Thus the word 'that' marks not the connection between causation and effect, but between the Divine antecedent and the human subsequent. 48. St. John 13:18, 19. 49. Ps. 41:9. 50. At the same time there is also a terrible literality about this prophetic reference to one who ate his bread, when we remember that Judas, like the rest, lived of what was supplied to Christ, and at that very moment sat at His Table. On Ps. 41 see the Commentaries. 51. 'ina frequenter ekbatikwV, i.e. de eventu usurpari dicitur, ut sit eo eventu, ut; eo successu, ut, ita ut' [Grimm, ad verb.] - Angl. 'so that.' And Grimm rightly points out that ina is always used in that sense, marking the internal connection in the succession of events - ekbatikwV not telikwV - where the phrase occurs 'that it might be fulfilled.' This canon is most important, and of very wide application wherever the ina is connected with the Divine Agency, in which, from our human view-point, we have to distinguish between the decree and the counsel of God. There is, indeed, behind this a much deeper question, to which brief reference has already formerly been made. Did Christ know from the beginning that Judas would betray Him, and yet, so knowing, did He choose him to be one of the Twelve? Here we can only answer by indicating this as a canon in studying the Life on earth of the God-Man, that it was part of His Self-exinanition - of that emptying Himself, and taking upon Him the form of a Servant52 - voluntarily to forego His Divine knowledge in the choice of His Human actions. So only could He, as perfect Man, have perfectly obeyed the Divine Law. For, if the Divine had determined Him in the choice of His Actions, there could have been no merit attaching to His Obedience, nor could He be said to have, as perfect Man, taken our place, and to have obeyed the Law in our stead and as our Representative, nor yet be our Ensample. But if His Divine knowledge did not guide Him in the choice of His actions, we can see, and have already indicated, reasons why the discipleship and service of Judas should have been accepted, if it had been only as that of a Jud�an, a man in many respects well fitted for such an office, and the representative of one of the various directions which tended towards the reception of the Messiah. In the meantime the Paschal Supper was proceeding. We mark this important note of time in the words of St. Matthew: 'as they were eating,'54 or, as St. Mark expresses it, 'as they reclined and were eating. '55 According to the Rubric, after the 'washing' the dishes were immediately to be brought on the table. Then the Head of the Company would dip some of the bitter herbs into the salt-water or vinegar, speak a blessing, and partake of them, then hand them to each in the company. Next, he would break one of the unleavened cakes (according to the present ritual the middle of the three), of which half was put aside for after supper. This is called the Aphiqomon, or after-dish, and as we believe that 'the bread' of the Holy Eucharist was the Aphiqomon, some particulars may here be of interest. The dish in which the broken cake lies (not the Aphiqomon), is elevated, and these words are spoken: 'This is the bread of misery which our fathers ate in the land of Egypt. All that are hungry, come and eat; all that are needy, come, keep the Pascha.' In the more modern ritual the words are added: 'This year here, next year in the land of Israel; this year bondsmen, next year free!' On this the second cup is filled, and the youngest in the company is instructed to make formal inquiry as to the meaning of all the observances of that night,56 when the Liturgy proceeds to give full answers as regards the festival, its occasion, and ritual. The Talmud adds that the table is to be previously removed, so as to excite the greater curiosity.57 We do not suppose that even the earlier ritual represents the exact observances at the time of Christ, or that, even if it does so, they were exactly followed at that Paschal Table of the Lord. But so much stress is laid in Jewish writings on the duty of fully rehearsing at the Paschal Supper the circumstances of the first Passover and the deliverance connected with it, that we can scarcely doubt that what the Mishnah declares as so essential formed part of the services of that night. And as we think of our Lord's comment on the Passover and Israel's deliverance, the words spoken when the unleavened cake was broken come back to us, and with deeper meaning attaching to them. 54. St. Matt. 26:21. 55. St. Mark 14:18. 56. Pes. x. 4. 57. Pes. 115 b. After this the cup is elevated, and then the service proceeds somewhat lengthily, the cup being raised a second time and certain prayers spoken. This part of the service concludes with the two first Psalms in the series called 'the Hallel,'58 when the cup is raised a third time, a prayer spoken, and the cup drunk. This ends the first part of the service. And now the Paschal meal begins by all washing their hands - a part of the ritual which we scarcely think Christ observed. It was, we believe, during this lengthened exposition and service that the 'trouble in spirit' of which St. John speaks59 passed over the soul of the God-Man. Almost presumptuous as it seems to inquire into its immediate cause, we can scarcely doubt that it concerned not so much Himself as them. His Soul could not, indeed, but have been troubled, as, with full consciousness of all that it would be to Him - infinitely more than merely human suffering - He looked down into the abyss which was about to open at His Feet. But He saw more than even this. He saw Judas about to take the last fatal step, and His Soul yearned in pity over him. The very sop which He would so soon hand to him, although a sign of recognition to John, was a last appeal to all that was human in Judas. And, besides all this, Jesus also saw, how, all unknown to them, the terrible tempest of fierce temptation would that night sweep over them; how it would lay low and almost uproot one of them, and scatter all. It was the beginning of the hour of Christ's utmost loneliness, of which the climax was reached in Gethsemane. And in the trouble of His Spirit did He solemnly 'testify' to them of the near Betrayal. We wonder not, that they all became exceeding sorrowful, and each asked, 'Lord, is it I?' This question on the part of the eleven disciples, who were conscious of innocence of any purpose of betrayal, and conscious also of deep love to the Master, affords one of the clearest glimpses into the inner history of that Night of Terror, in which, so to speak, Israel became Egypt. We can now better understand their heavy sleep in Gethsemane, their forsaking Him and fleeing, even Peter's denial. Everything must have seemed to these men to give way; all to be enveloped in outer darkness, when each man could ask whether he was to be the Betrayer. 58. Ps. 113 to 118. 59. St. John 13:21. 61. The reading adopted in the R.V. of St. John 13:24 represents the better accredited text, though it involves some difficulties. At present, the Supper itself begins by eating, first, a piece of the unleavened cake, then of the bitter herbs dipped in Charoseth, and lastly two small pieces of the unleavened cake, between which a piece of bitter radish has been placed. But we have direct testimony, that, about the time of Christ,63 'the sop'64 which was handed round consisted of these things wrapped together: flesh of the Paschal Lamb, a piece of unleavened bread, and bitter herbs.65 This, we believe, was 'the sop,' which Jesus, having dipped it for him in the dish, handed first to Judas, as occupying the first and chief place at Table. But before He did so, probably while He dipped it in the dish, Judas, who could not but fear that his purpose might be known, reclining at Christ's left hand, whispered into the Master's ear, 'Is it I, Rabbi?' It must have been whispered, for no one at the Table could have heard either the question of Judas or the affirmative answer of Christ.66 It was the last outgoing of the pitying love of Christ after the traitor. Coming after the terrible warning and woe on the Betrayer,67 it must be regarded as the final warning and also the final attempt at rescue on the part of the Saviour. It was with full knowledge of all, even of this that his treachery was known, though he may have attributed the information not to Divine insight but to some secret human communication, that Judas went on his way to destruction. We are too apt to attribute crimes to madness; but surely there is normal, as well as mental mania; and it must have been in a paroxysm of that, when all feeling was turned to stone, and mental self-delusion was combined with moral perversion, that Judas 'took'68 from the Hand of Jesus 'the sop.' It was to descend alive into the grave - and with a heavy sound the gravestone fell and closed over the mouth of the pit. That moment Satan entered again into his heart. But the deed was virtually done; and Jesus, longing for the quiet fellowship of His own with all that was to follow, bade him do quickly that he did. 63. The statement is in regard to Hillel, while the Temple stood. 64. Mark the definite article - not 'a sop.' 65. Jer.Chall. 57 b. 66. St. John 13:28. 67. St. Matt. 26:24; St. Mark 14:21. But even so there are questions connected with the human motives that actuated Judas, to which, however, we can only give the answer of some suggestions. Did Judas regard Christ's denunciation of 'woe' on the Betrayer not as a prediction, but as intended to be deterrent - perhaps in language Orientally exaggerated - or if he regarded it as a prediction, did he not believe in it? Again, when after the plain intimation of Christ and His Words to do quickly what he was about to do, Judas still went to the betrayal, could he have had an idea - rather, sought to deceive himself, that Jesus felt that He could not escape His enemies, and that He rather wished it to be all over? Or had all his former feelings towards Jesus turned, although temporarily, into actual hatred which every Word and Warning of Christ only intensified? But above all and in all we have, first and foremost, to think of the peculiarly Judaic character of his first adherence to Christ; of the gradual and at last final and fatal disenchantment of his hopes; of his utter moral, consequent upon his spiritual, failure; of the change of all that had in it the possibility of good into the actuality of evil; and, on the other hand, of the direct agency of Satan in the heart of Judas, which his moral and spiritual ship-wreck rendered possible. From the meal scarcely begun Judas rushed into the dark night. Even this has its symbolic significance. None there knew why this strange haste, unless from obedience to something that the Master had bidden him.69 Even John could scarely have understood the sign which Christ had given of the traitor. Some of them thought, he had been directed by the words of Christ to purchase what was needful for the feast: others, that he was bidden go and give something to the poor. Gratuitous objection has been raised, as if this indicated that, according to the Fourth Gospel, this meal had not taken place on the Paschal night, since, after the commencement of the Feast (on the 15th Nisan), it would be unlawful to make purchases. But this certainly was not the case. Sufficient here to state, that the provision and preparation of the needful food, and indeed of all that was needful for the Feast, was allowed on the 15th Nisan.70 And this must have been specially necessary when, as in this instance, the first festive day, or 15th Nisan, was to be followed by a Sabbath, on which no such work was permitted. On the other hand, the mention of these two suggestions by the disciples seems almost necessarily to involve, that the writer of the Fourth Gospel had placed this meal in the Paschal Night. Had it been on the evening before, no one could have imagined that Judas had gone out during the night to buy provisions, when there was the whole next day for it, nor would it have been likely that a man should on any ordinary day go at such an hour to seek out the poor. But in the Paschal Night, when the great Temple-gates were opened at midnight to begin early preparations for the offering of the Chagigah, or festive sacrifice, which was not voluntary but of due, and the remainder of which was afterwards eaten at a festive meal, such preparations would be quite natural. And equally so, that the poor, who gathered around the Temple, might then seek to obtain the help of the charitable. 69. To a Jew it might seem that with the 'sop,' containing as it did a piece of the Paschal Lamb, the chief part in the Paschal Supper was over. 70. The Mishnah expressly allows the procuring even on the Sabbath of that which is required for the Passover, and the Law of the Sabbath-rest was much more strict than that of feast-days. See this in Appendix XVII., p. 783. The departure of the betrayer seemed to clear the atmosphere. He was gone to do his work; but let it not be thought that it was the necessity of that betrayal which was the cause of Christ's suffering of soul. He offered Himself willingly - and though it was brought about through the treachery of Judas, yet it was Jesus Himself Who freely brought Himself a Sacrifice, in fulfilment of the work which the Father had given Him. And all the more did He realise and express this on the departure of Judas. So long as he was there, pitying love still sought to keep him from the fatal step. But when the traitor was at last gone, the other side of His own work clearly emerged into Christ's view. And this voluntary sacrifical aspect is further clearly indicated by His selection of the terms 'Son of Man' and 'God' instead of 'Son' and 'Father. '71 'Now is glorified the Son of Man, and God is glorified in Him.72 And God shall glorify Him in Himself, and straightway shall He glorify Him.' If the first of these sentences expressed the meaning of what was about to take place, as exhibiting the utmost glory of the Son of Man in the triumph of the obedience of His Voluntary Sacrfice, the second sentence pointed out its acknowledgment by God: the exaltation which followed the humiliation, the reward73 as the necessary sequel of the work, the Crown after the Cross. 72. The first in ver. 32 of our T.R. seems spurious, though it indicates the logical nexus of facts. 73. Probably the word 'reward' is wrongly chosen, for I look on Christ's exaltation after the victory of His Obedience as rather the necessary sequence than the reward of His Work. Thus far for one aspect of what was about to be enacted. As for the other - that which concerned the disciples: only a little while would He still be with them. Then would come the time of sad and sore perplexity - when they would seek Him, but could not come whither He had gone - during the terrible hours between His Crucifixion and His manifested Resurrection. With reference to that period especially, but in general to the whole time of His Separation from the Church on earth, the great commandment, the bond which alone would hold them together, was that of love one to another, and such love as that which He had shown towards them. And this - shame on us, as we write it! - was to be the mark to all men of their discipleship.74 As recorded by St. John, the words of the Lord were succeeded by a question of Peter, indicating perplexity as to the primary and direct meaning of Christ's going away. On this followed Christ's reply about the impossibility of Peter's now sharing his Lord's way of Passion, and, in answer to the disciple's impetuous assurance of his readiness to follow the Master not only into peril, but to lay down his Life for Him, the Lord's indication of Peter's present unpreparedness and the prediction of His impending denial. It may have been, that all this occurred in the Supper-Chamber and at the time indicated by St. John. But it is also recorded by the Synoptists as on the way to Gethsemane, and in, what we may term, a more natural connection. Its consideration will therefore be best reserved till we reach that stage of the history. We now approach the most solemn part of that night: The Institution of the Lord's Supper. It would manifestly be beyond the object, as assuredly it would necessarily stretch beyond the limits, of the present work, to discuss the many questions and controversies which, alas! have gathered around the Words of the Institution. On the other hand, it would not be truthful wholly to pass them by. On certain points, indeed, we need have no hesitation. The Institution of the Lord's Supper is recorded by the Synoptists, although without reference to those parts of the Paschal Supper and its Services with which one or another of its acts must be connected. In fact, while the historical nexus with the Paschal Supper is evident, it almost seems as if the Evangelists had intended, by their studied silence in regard to the Jewish Feast, to indicate that with this Celebration and the new Institution the Jewish Passover had for ever ceased. On the other hand, the Fourth Gospel does not record the new Institution - it may have been, because it was so fully recorded by the others; or for reasons connected with the structure of that Gospel; or it may be accounted for on other grounds.75 But whatever way we may account for it, the silence of the Fourth Gospel must be a sore difficulty to those who regard it as an Ephesian product of symbolico-sacramentarian tendency, dating from the second century. 75. Could there possibly be a hiatus in our present Gospel? There is not the least external evidence to that effect, and yet the impression deepens on consideration. I have ventured to throw out some hints on this subject in 'The Temple and its Services,' Appendix at close. If we now ask ourselves at what part of the Paschal Supper the new Institution was made, we cannot doubt that it was before the Supper was completely ended.77 We have seen, that Judas had left the Table at the beginning of the Supper. The meal continued to its end, amidst such conversation as has already been noted. According to the Jewish ritual, the third Cup was filled at the close of the Supper. This was called, as by St. Paul,78 'the Cup of Blessing,' partly, because a special 'blessing' was pronounced over it. It is described as one of the ten essential rites in the Paschal Supper. Next, 'grace after meat' was spoken. But on this we need not dwell, nor yet on 'the washing of hands' that followed. The latter would not be observed by Jesus as a religious ceremony; while, in regard to the former, the composite character of this part of the Paschal Liturgy affords internal evidence that it could not have been in use at the time of Christ. But we can have little doubt, that the Institution of the Cup was in connection with this third 'Cup of Blessing. '79 If we are asked, what part of the Paschal Service corresponds to the 'Breaking of Bread,' we answer, that this being really the last Pascha, and the cessation of it, our Lord anticipated the later rite, introduced when, with the destruction of the Temple, the Paschal as all other Sacrifices ceased. While the Paschal Lamb was still offered, it was the Law that, after partaking of its flesh, nothing else should be eaten. But since the Paschal Lamb had ceased, it is the custom after the meal to break and partake as Aphikomon, or after-dish, of that half of the unleavened cake, which, as will be remembered, had been broken and put aside at the beginning of the Supper. The Paschal Sacrifice having now really ceased, and consciously so to all the disciples of Christ, He anticipated this, and connected with the breaking of the Unleavened Cake at the close of the Meal the institution of the breaking of Bread in the Holy Eucharist. 77. St. Matt. 26:26; St. Mark 14:22. 78. 1 Cor. 10:10. 79. Though, of course, most widely differing from what is an attempt to trace an analogy between the Ritual of the Romish Mass and the Paschal Liturgy of the Jews, the article on it by the learned Professor Bickell, of Innsbruck, possesses a curious interest. See Zeitsch. fur Kathol. Theol. for 1880, pp. 90-112. 81. The words area hitherto unprinted utterance on this subject by the late Professor J. Duncan, of Edinburgh.